of young children in oversized adult clothing. cards and posters for the last fifteen years and have won praise worldwide, especially in the US. Pictured right: 1999 Limited Edition ‘Sharing Friendship, Laughter And Love – Three Girls Having Tea’. dated glass ornaments, plaques, photo frames, and mugs. The collection from ENESCO is now retired. 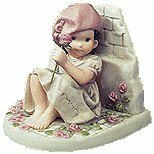 – Girl With Rose Leaning On Wall’. Outside of the Pretty as a Picture figurine range, Kim Anderson’s work can also be seen in books, posters, on collectors plates, snowglobes and obviously original photograhs are very collectible. Pretty As A Picture TM.